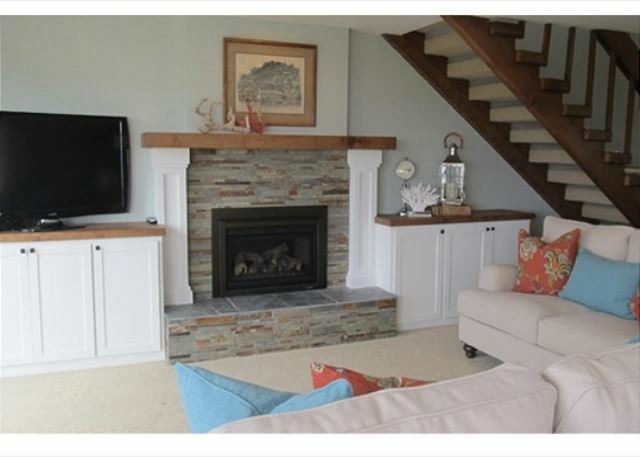 Downstairs, the updated living room features two sofas, gas fireplace, cable TV. In the corner, cozy chairs offer a perfect spot to have coffee in the morning while watching the waves break. 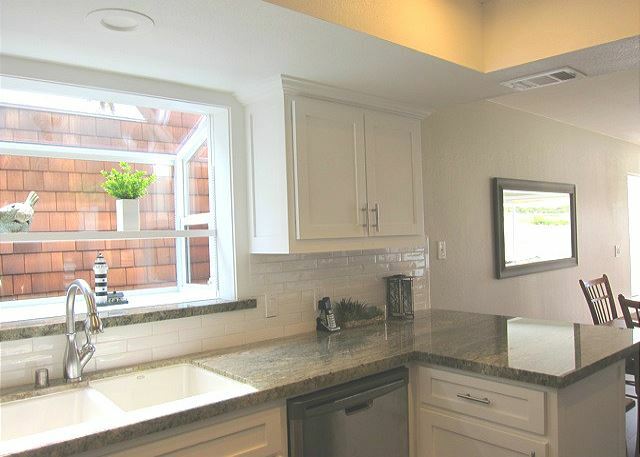 The new kitchen with granite counter tops, stainless appliances, and a gas stove, is perfect for cooking after a trip to the farmer's market. A ranch-front deck off the living room is ideal for enjoying the sunset with a glass of wine. The airy upstairs bedroom is spacious, with a king size bed, huge windows and panoramic views. It also has a sitting area where you can read a book, or occasionally spot whales, otters and deer. 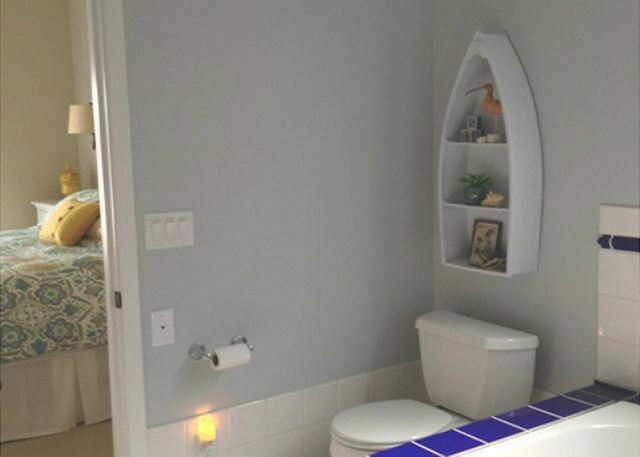 The upstairs also has a remodeled master bath with large shower, and a roof top deck. 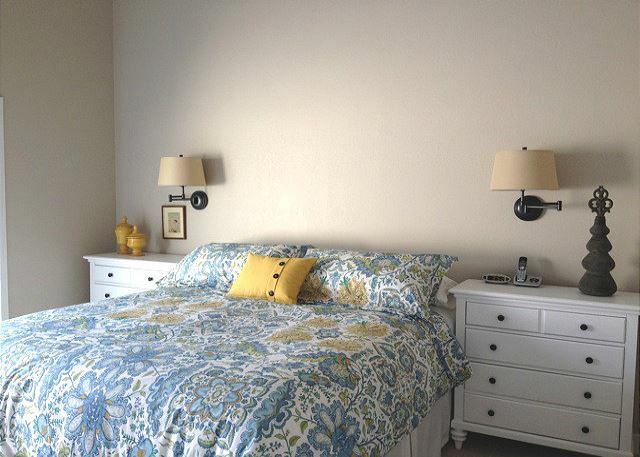 Downstairs, the second bedroom is furnished with a king size bed, private access to the downstairs bath, and a patio. 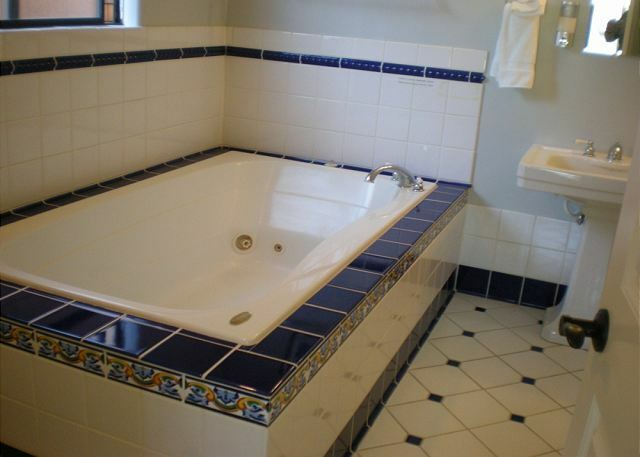 Due to strict water restrictions in Cambria, the Jacuzzi tub is not available at this time. No smoking, no pets. NIGHTLY MINIMUMS AND RATES VARY SUMMER AND HOLIDAYS. Incredible location. Instant access to the Fiscalini open space. Like living in a nature preserve. The house was exceptional. very clean and with a great view of the ranch and the ocean. Short walk to hiking trails. We've stayed here twice and hope to come again. 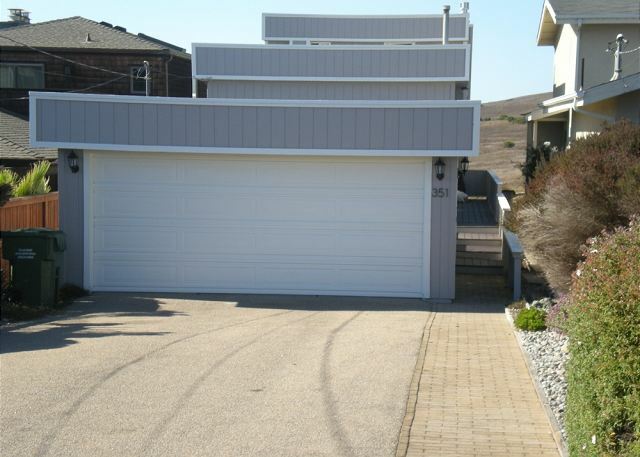 Beautifully appointed house with stunning views of the ocean and ranch-land, which are both close by. In fact the small deck "sits on", and thus directly overlooks, the ranch-land, which is at the back of the house. Wonderful for watching birds and wildlife. (Deer wander past in the evening.) Two comfortable and roomy bedrooms with super beds, an excellent kitchen and comfortable living room. Good TV too! Two good bathrooms, though our one complaint is that both toilets are very low down, as has been mentioned by at least one other reviewer. The house is in a very quiet location and at night the only sound was the gentle noises of the ocean. It was very clean and well-provided with "extras", like pillows and throws. (I feel reluctant to praise the house too much, in case it's all booked-up when we want it!). 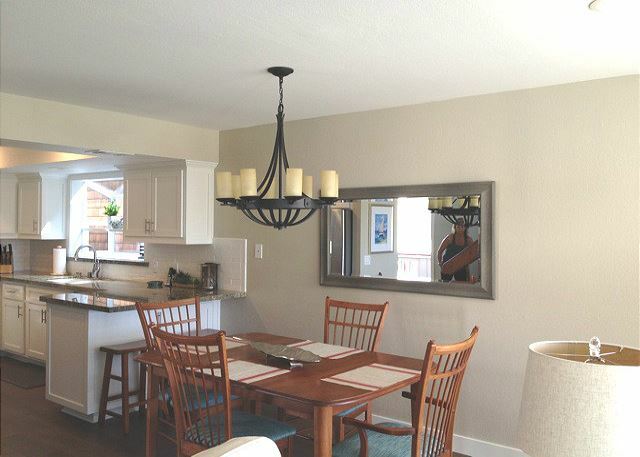 Overall, a wonderful Cambria home! Very good, however very few instructions for check out requirements. By far the best of our three stays at this property. Love the location of this property. 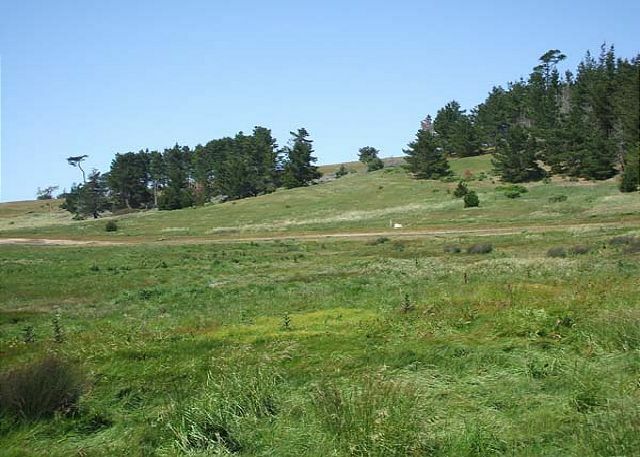 I have rented this property several times and enjoy the view of ocean, forest and meadow. Great path along the bluff for walks. Home has been nicely renovated and was very comfortable. Marine Terrace is my favorite place to stay. Beautiful view, very clean, and comfortable. The view was gorgeous. The house was well appointed with lovely décor. It was perfect for 2 single people- great kitchen ! I was disappointed the fireplace was not working and it appeared the decks and beautiful windows were not maintained on a regular basis. The staff from Coastal Escapes were outstanding. Super house just needs some regular maintenance especially outside. We've stayed here several times and have been thrilled each and every time. A friend and I stayed at the Wedgewood home over the President's Day weekend. We had a wonderful time. After some hectic weeks at work, it was so nice to come and decompress in Cambria. Indeed, the Wedgewood home turned out to be the ideal place to come and relax and enjoy the Central Coast of California. The home offered spectacular views of the preserve and the ocean. It was also extremely clean and well-appointed, and the beds were so incredibly comfortable! Needless to say, we thoroughly enjoyed our stay, and we will definitely visit again soon. Thank you! We were very pleased with 351 Wedgewood. Fantastic location. It rained most of the weekend but we enjoyed the view from the house and short hikes between rain showers. The sun finally came out the day we left, and management granted us a late checkout so we could enjoy a walk in the sun. Only (tiny) complaints about the house: the downstairs bathroom has no counter space, and there are no TV's in the bedrooms. Nice kitchen! Loved the house and location, a couple of issues. Toilets are too low, the dishwasher hits the cabinet pull when opened all the way, could not figure out how to close the lazy susan cabinet. Its always peaceful and relaxing!home was very comfortable and just right for a couple. Celebrating Our Wedding Anniversary In Style! An absolutely lovely home, with beautiful arrangements for 2 couples. 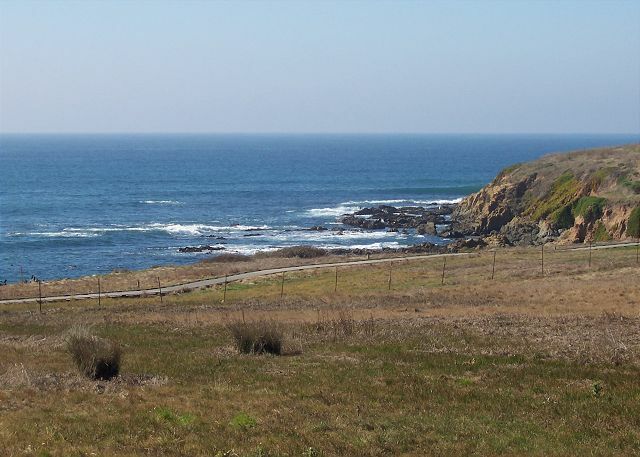 The view of the ocean and Ranch are wonderful, and the walkway is very accessible! Our only problems were when fixtures (towel bars and blind-holders) came out of the sheet-rock walls, and hot water faucet in lower bathroom sink did not work. However, these were minor, and I am sure will be taken care of! The vacation was Wonderful! The Wedgewood house was wonderful! 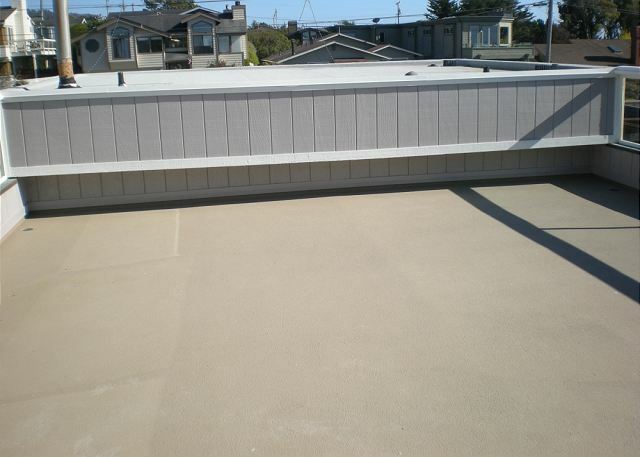 Extremely clean, with all the amenities provided. The view from the living room and upstairs bedroom was outstanding. It is very close to the trails at Fiscalini Ranch that provided "up close and personal" spectacular sunsets. Will definitely stay again. As good as it gets !!!! I almost do not want to write anything about this vacation rental. Honestly... I fear that if I give my honest opinion too many people will go and we will have a hard time renting it again next summer .... I am only writing this review because I want to thank the owner for having built such a wonderful, wonderful place, for putting so much effort, so much love and thought into it. If we could buy this house ....we would! My husband also said he has never ever seen a nicer holiday rental in his entire life, he is eight years older than I. Our two boys loved it and were sad we didn't stay longer. It is the best place we have ever rented. We have stayed at many, many different vacation rentals both in the United States and in Europe. We do not like staying in a hotel, that is why all of our holiday experiences are based on rentals. This house is the finest, most beautiful, most spacious place with the greatest view ever. It has the best energy, very peaceful. Who was the interior decorator? I can only congratulate the person on the job. The place is not overloaded, every room a perfect design, you couldn't have done a better job. The beds are comfortable, the bathrooms are great, it is so clean, you could eat off the floor! 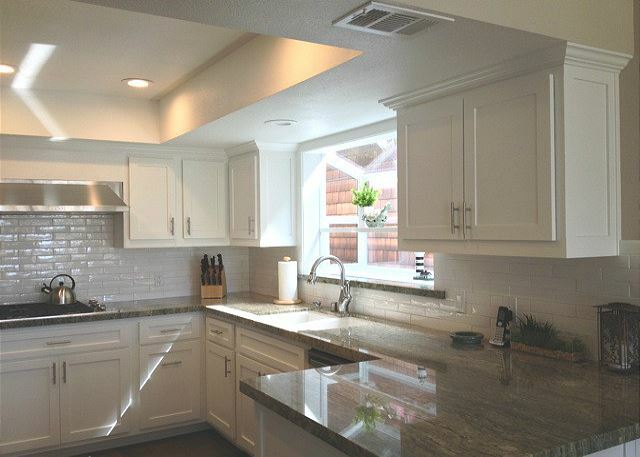 The kitchen is marvelous as well. The only little drawback we experienced was that the vacation rental office closed a little bit on the early side. We arrived late the first day which was our fault. But the following day we tried to hand in the rental agreement in person again during opening hours and nobody was there again. In the end it was no problem though because we just put the papers through an opening in the door. Thanks for trusting us. So, to cut it short: We will be back next summer in beautiful Cambria! we stayed at 351 Wedgewood for five nights and enjoyed deer, Dolphins, and whale sightings while sitting in the house. The hikes, beaches, and tide pools were amazing as well. I look forward to staying here again. Exceptional place to stay, top notch accomodations, a view that I taped in my mind and replay as the days go by. My family had a great stay at this home. At first we were worried about how close it was to neighboring houses. But once inside, it was like the neighbors disappeared. We didn't experience any unwanted noise. When you walk in, you're greeted by amazing views of the wilderness reserve and ocean. The loft bedroom, too, has amazing views. A remodel on the house was just completed so a number of the glitches that earlier guests mentioned have been fixed. Everything was perfectly clean. There were a couple that we encountered but we've mentioned them to the rental company, and I imagine that they'll be fixed. There was plenty of room for my husband and I and our grown daughter with her boyfriend. We were a little over a block away from the start of the boardwalk in the wilderness preserve. A great visit and we want to do it again! What a present surprise! It is a charming upgraded modern house with open view and sea breeze. A perfect house for relax! Location is great and views are amazing. Quiet and clean. We will be back. I have rented vacation homes before, but this management company was the most professional and attentive. It made the rental process easy. The house was amazing with a spectacular view of the ocean. The house had everything we needed and more. Great location with deer grazing outside in the mornings, so beautiful. And the downstairs bathroom had a huge jaccuzzi tub. Our only glitch was the power going out one night, but it was the whole block, so we just had flashlights but it made it an even cooler experience to experience Cambria and the house. Great stay, highly recommend it! Sadly the water heater was leaking when we arrived but the management company had a plumber and carpet guy out within an hour and repairs were made quickly and without much imposition on the stay, thanks for a great job on that. Otherwise the property is a fantastic location for a peaceful getaway. Our second time staying here. We spent time at this rental at Thanksgiving. 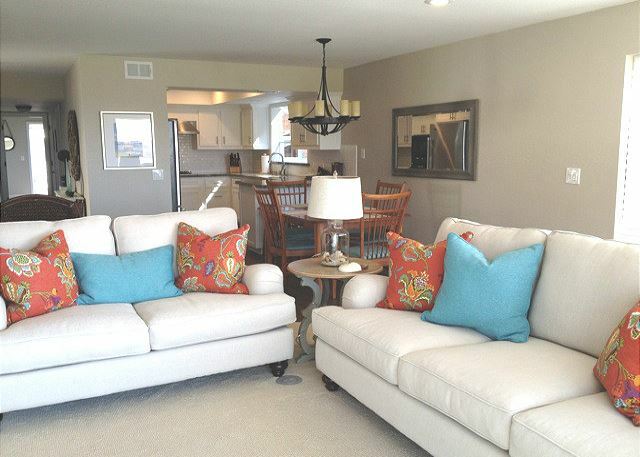 We absolutely love the location next to the walking trail and close to the ocean. We saw whales with our bare eyes from the rental! The floor to ceiling windows in the living room and the upstairs bedroom provide amazing views. 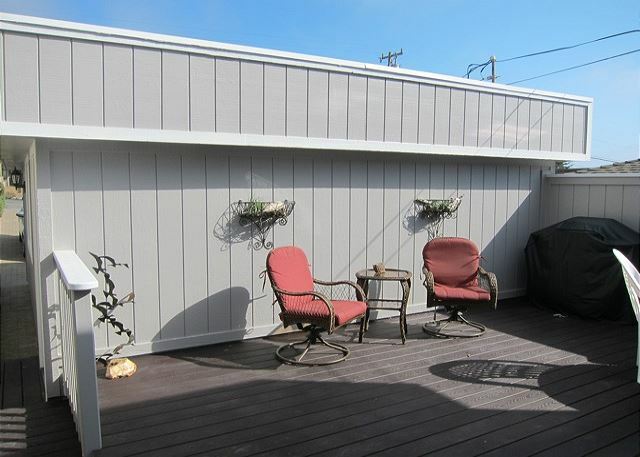 My only criticism would be the condition of the decks and the deck furniture. Also, if you turn on the jets in the Jacuzzi tub, gunk comes out. That being said, we'll be back! Great spot for a much needed time of R&R! Wonderful view and location. Proximity to walking trails is a big plus. We also appreciated the complete kitchen. Amazing location ... great value! The home was clean but some items need to be replaced. The toilet seat in the bathroom upstairs is old and missing one of the risers on the seat. The tub was not working. The hot water flowed at a very slow rate which would have taken an hour to fill. Disappointed. Overall the house was clean and well maintained. The sofas in the living room are very hard and uncomfortable and could use updating. All this said just for the purpose of needed repairs. We will still continue to come to this home for our get away. Thanks for sharing your home. Wow!This house was 99% great! Directions were exact, house clean and well stocked. Location was wonderful. Hiking trails right behind the house, short walk to the beach and views to die for. Nice TV, rooms were spacious, upstairs view was amazing. No complaints, but tub downstairs does fill VERY slowly, but hey we had time. We will positively return. Great $ value - super view! View from the upstairs master bedroom is fantastic! Other reviews said the living room sofas were uncomfortable - we didn't feel that way at all. New flat screen TV and kitchen pots & pans were nice. No foil or plastic wrap in kitchen, which would have been nice, but other than that the kitchen was very well stocked. Hiking trails were fabulous - we took our wine and enjoyed the sunsets from a bench along the trail each night we were there. This was our first visit to 351 Wedgewood - but we'll be back again! A beautiful location and getaway. The tub in the downstairs bath fills very slowly and could be looked at. A great location. We love the 351 wedgewood property, this was our 2nd stay within the last two years. 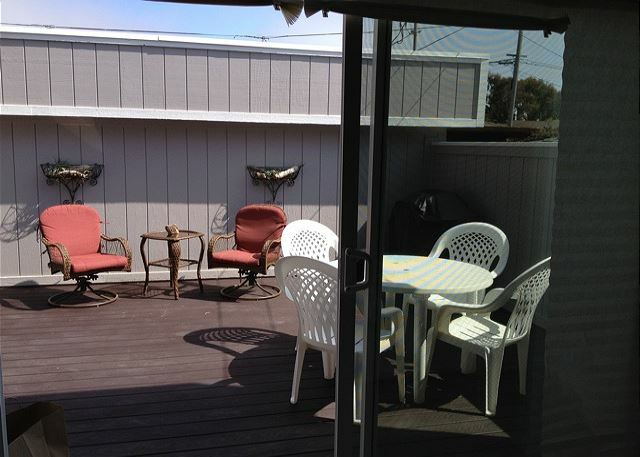 The location offers a awesome view of the ocean,hiking trails and peace and quiet. I have recommended this property to my family and friends as the utimate get away spot. We would definitely love to stay at this property again. Best location ever! Friends who visited were impressed and delighted, and you willhear from them in the near future. a great value and I would stay there with my family again... just unscrew the two porch lights on the garage and you are good to go! We rented this home @ the end of June 2011. The home was very comfortable and clean. The beds were comfortable. 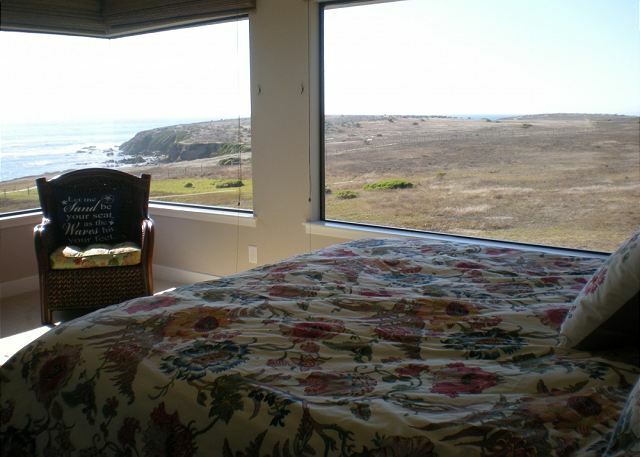 The upstairs bedroom is more of a loft area, with a bathroom, but it does have the best ocean views. The home backs up to ranch land which means you have no homes in front of you, which is very only complaint is when we arrived the windows had not been cleaned, so my husband had to go out and attempt to clean them. Over all we had a very nice time. We really enjoyed our stay. 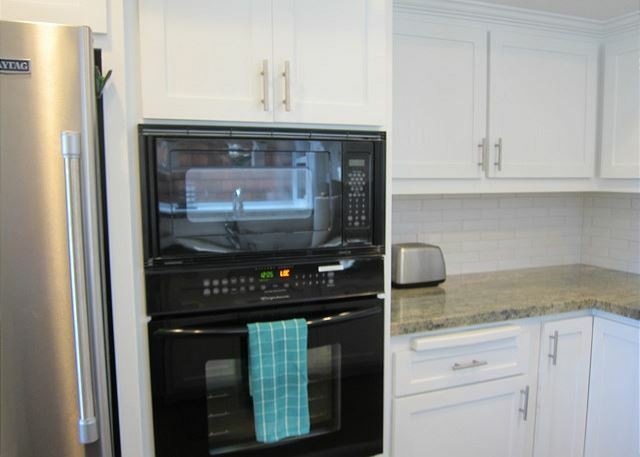 The house is in a fantastic location, was very clean and very well equipped/stocked. The Jacuzzi tub needs repair. Other than that, we were quite pleased with 351 Wedgewood! Loved the house and will stay there again. Loved sitting in the rocker chairs looking out of the windows at the herons on the ranch land. The house had everything we needed and we had a good night's sleep in the very comfortable bed. This is a lovely property and possibly the best we have stayed at so far. Very well maintained and loaded with conveniences including coffee grinder, wireless internet, the ability to park in an enclosed garage were all a plus as were the views from the living room and master bedroom upstairs. This would be great for 2 couples to share as each would have the privacy of of their own bedroom/ bath. I agree the couches were a little difficult to get in and out of but very nice to 'cozy' in, besides the platform rockers and dining chairs suited us just fine. Nicely decorated without alot of the clutter you see in many rentals. We truly enjoyed viewing the wildlife. We had a Great Blue Heron in the field behind us to keep us entertained on a daily basis, not to mention the deer and Common Egrets, plus the gentle sounds of croaking frogs at night. i love staying there. have rented this house about 7 times! ideal for me. 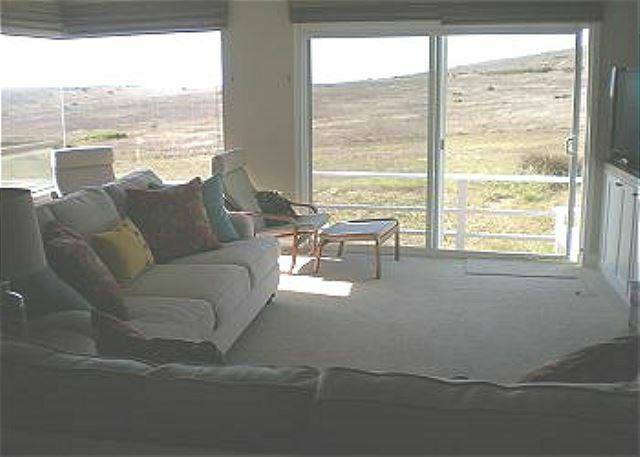 This is a wonderful house - great view of the ocean and access to oodles of hiking trails. The house description should include a statement that the second floor bedroom is loft-like; i.e., a stairway up but no door at the top. It did not affect our enjoyment of the house but it might make a difference to other potential renters. We planned to stay 3 nights & added an extra one because it was such a beautiful, peaceful, comfortable visit. Awesome view! Kitchen was great for cooking, we only went out twice (loved Hamlet @Moonstone Gardens) Walked & ran the trails... so perfect. We were lucky to have no neighbors at home & gorgeous weather. We stayed at Ragged Point last visit & this was even better. The house itself could use some TLC, but overall-just fine! We thoroughly enjoyed our week long stay at this property. Everything we needed to prepare meals, linens provided, & the washer/dryer came in handy, too. All the "comforts" of home, but away from home. Wonderful to wake up each morning, make coffee, looking out over the Preserve, walk on any of the trails, then watch the sunset each night while eating dinner and read a book or watch TV by the fire. Even a pair of fawns sought shelter under the deck & emerged to bound up the hill! Left the window open each night, could hear the surf & enjoyed the crisp clean air. This is the best we've slept in ages! might be nice to have a tv in the upstairs bedroom. We like Cambria, Marine Terrace and especially Wedgewood very much. Thank you for replacing the cookware & the bathroomm towels. The property is nice & in a great location. The couches/loveseats in the living room are not very friendly for older people to get in & out of. It also feels like you are sitting on the frame of the furniture instead of the cushions. Every moment was great! As a Floridian, I love to escape to the coast of California in the summer... I stayed at another property on Wedgewood last year but this one was even better! The views and house were great... a wonderful 9 days! Great walking trails, wonderful views. Problems with remotes to TV and garage. My only negative comment would be that it is a bit misleading calling this property a 2 bedroom... It is more of a one bedroom with a loft. If my husband and I weren't as close to the other couple that we rented the home with, it could have been a bit awkward. We love this home! The location with its unlimited view can't be beat. The towels are a bit ragged and it would be nice to have small bars of soap provided as has been done in other homes we've rented in the area. These are minor "problems" and certainly won't stop us from staying here many more times. The cookware(Teflon lined) were in terrible condition and were unhealthy to use because of the scratches. Other than a problem we had at home we had a wonderful stay. The 2 love seats in the living room are very unconfortable. Great get-away location for those that want to just lay back and relax, or spend time out and about! Nearby walking trails and ocean front views some of the best we ever experienced. It was a good way to spend our 27th together. The spa tub was perfect. The home offers many places to just sit and watch the waves come in and go back out again. It just wasn't long enough of a stay. I'd love to see a bigger TV in the living room and put the smaller one in the bedroom. That would be my only request. Other than the short stay and the smaller TV, it was perfect. I did appreciate the cable though. We had a great weekend stay. The view was spectacular and it was so quiet and peaceful. We have rented from Coastal Escapes before and once again had a wonderful experience! The location and the view is great. The wicker chairs need to be replaced, they are falling apart. Also, the patio has some lose bars. I would have given all categories 5 stars except for the fact the jacuzzi tub did not have hot water and the water in the downstairs bathroom shower was only lukewarm. Otherwise it was great, close to walkway through the preserve, quiet and very clean. Enjoyed our stay! The front door was difficult to unlock. The bed in the loft was sooo comfortable and the view was spectacular. We're big on tidepools... The kids got to see tons of eels, crabs, starfish, an octopus, and we came within twelve or fifteen feet of an elephant seal before she let us know she was there (boy did she let us know). The kitchen needs updating but everything worked just fine.